Acrossair, one of the pioneering companies in augmented reality on the iPhone, just made it to the iPhone app store with a new app: acrossair augmented reality browser. Previous apps by Acrossair were task specific: find the Nearest Tube, Nearest Places and Nearest Tweets. Today, it’s joining the likes of Layar and Wikitude as multipurpose AR browsers. Congratulations. Let’s take a look at the new browser. 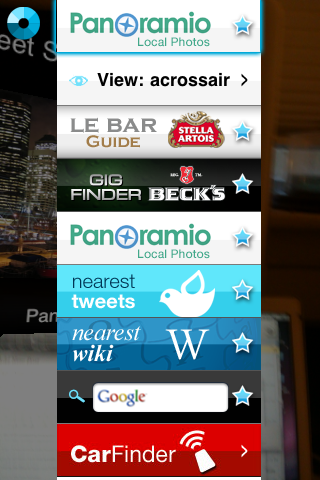 First screen aggregates various information sources such as Panoramio, Stella Artois – LE BAR Guide as well as Acrossair previous apps such as Nearest Tube, etc. Scroll through the long list by swiping your finger iPhone style. Once an information source is selected, you get to see the nearest as points of interests (POIs). The browser uses awesome 3D navigation which you can see as you spin around. 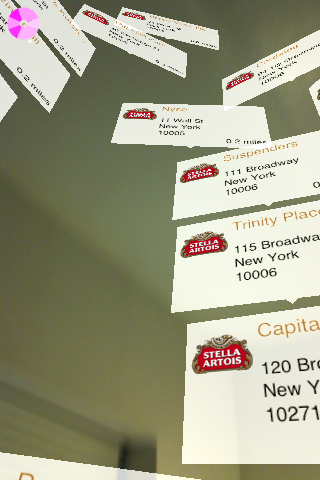 There is local data from property companies and big name brands which is represented in an augmented reality view. Holding it flat jumps to a Google maps view and when you spin around so does the browser to make sure you know where everything is in orientated. What will be Acrossair next steps? Will they open it for developers? for user generated content? We’ll have to see how things unfold in 2010 which is promising to be a hot year!